Quality products and services at the lowest cost and in the quickest time. A universal standard that every company must follow to compete in today’s markets. Every molded plastics part must run smoothly through product design, tool building, tryouts, manufacturing, assembly, field applications, and over the life of products. Our expertise in CAE (computer aided engineering) in conjunction with the experience of hundreds of molded products provides a valuable link to reach the goal of producing quality products at the lowest cost and in the shortest time. Our engineers will analyze for mold filling, cooling, and warp (deformation) … for every part with the tooling design as well as scientifically validating key steps to make your product a success – designed and built right the very first time. Our unmatched expert approach to every project provides the best value in the long term and will save you cost and time. The above “prototype part” customer wants to avoid knit lines (welding lines) in the branches. We have tried the possible injection gate locations in the mold and it has helped to change some wall thickness in some key areas producing good results at the designing stage. This saved more than ten thousand dollars for the customer by avoiding an engineering change. The Multi-cavity mold will have filling balance problems. 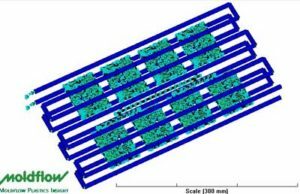 Mold flow analysis at the design stage can avoid the foreseeable risk for runner and design. This will save cost and time. We can also insure the solution without any risk. Mold cooling time is the single biggest factor in the overall cycle time; it becomes imperative to perform cooling analysis on every tool to reduce overall cooling time and cycle time that adds directly to the profit. Sositar Engineering services will eliminate problems before they occur and save cost and timing to increase client’s profits and quality. For each tool we make we will find the best cooling system possible. Ever increasing pressures using innovative materials, product designs, and continuous integration of components in one product becomes real challenge. Meeting dimensional and quality requirements without adding any additional costs is also a challenge. Although the science of warp analysis prediction needs to be improved, it provides a most efficient way of prediction of problems and paves the way for preventive measures during the early stages. Experience and expertise can really make the difference in such innovative design, tooling, and process measures to prevent or minimize the warp problems.